The Man Beyond Men playing a Man from Beyond. In 1922, an Arctic expedition finds a man frozen in the ice since 1820, thaws him out, and introduces him to “modern” society, where he meets a girl named Felice, whom he thinks is his lost love named Felice; she proves to be a descendant of the original Felice, and, like that Felice, also needs help finding her father. THE MAN FROM BEYOND is no longer a film worth watching for the pleasure of watching a movie. In 2014, it is merely a curio; a black and white silent film with a workable plot and characters with indecipherable motivations. And of course, the 1920’s methods of framing, staging, editing, theatrical acting, and just plain “movie-making” have rendered these old films unwatchable. The only academic reason to watch this film is for its star: The Escapist, The King Of Handcuffs, The Man Of Marvels, The Mysteriarch – Harry Houdini! Nearly 90 years after his death, his name is still synonymous with magic, escapism, almost inhuman feats of daring (his infamous straitjacket escapes hanging from a skyscraper, the Chinese Water Torture Cell, being buried alive, etc.). And it is a thrilling, almost mystic experience to see this giant of his age in live action. The live action itself is soporific, and doesn’t convey an ounce of the man’s remarkable ingenuity, charisma or power. It’s just cool to see him. Period. Houdini is the frozen man, named Howard Hillary. (He’s not really from “beyond,” just the past.) And he’s running around with this girl that some bad guys want to, uh, kill? marry? kidnap? Who knows? Who cares? The movie is little more than a construct to lead Howard Hillary into situations where he must “escape” – wet sheets in an insane asylum, climbing down the side of a building, escape going over Niagara Falls! And even then, it is a miniscule amount of screentime given to these events, and to a modern eye they don’t achieve what I’m presuming the movie’s aim was back then: to advertise the hook of Harry Houdini’s live stage shows. Because seeing escapes on film (in the “magic of movies”) is nothing compared to the drama of seeing them in real life, where real stakes and lives hang in the balance. The movies are a medium where we are used to seeing magical things happen every single second onscreen, so even though Houdini The Man is performing those real stunts that elevated him to the courts of kings and archdukes, due to the nature of the medium, they look passé. And the rudimentary filmmaking of the day could add nothing in the way of excitement or urgency to them; matter of fact, they look lame by today’s standards of stuntwork. We cannot fault Houdini for his bad acting. Everyone was a bad actor back then. And even if they exhibited a comfortable air onscreen, their performances were invaded at regular intervals by title cards telling us what they were saying and explaining plot. And that constant piano backing track only added to the melodrama of people raising their arms to their foreheads to signify grief or trauma. But then, everything was melodrama back then. Interesting to note that in the film’s final scene, Howard is seen reading a book on spiritualism by Arthur Conan Doyle (yes, Sherlock’s creator). Doyle in real life was a bane to Houdini, forever hounding him that spirits and mediums were authentic, no matter Houdini constantly exposing their fraudulent methods. Movie actually sides with Doyle, in making Howard profess reincarnation as the reason why he and the modern Felice are in love again. The biggest question in the movie is how this nondescript young man named Howard Hillary happened to be so proficient at escaping straitjackets and fisticuffing bad guys and climbing buildings like a human fly – was he Harry Houdini or something? Writers: Harry Houdini, Coolidge Streeter. Starring: Harry Houdini, Arthur Maude, Albert Tavernier, Erwin Connelly, Frank Montgomery, Luis Alberni, Yale Benner, Jane Connelly. The Secret Life Of Houdini: The Making Of America’s First Super Hero, by William Kalush and Larry Sloman. 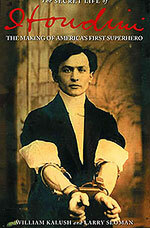 A definitive take on a pioneer and powerful personality, revealing many of Houdini’s methods, covering his extensive career in magic, escapism, his dabbling in movies, debunking spirit mediums, and even his fledgling spywork for the American government.